ONLY for use with AEM Wideband UEGO Controllers 30-2300 & 30-2301! This part is only a display and NOT a UEGO CONTROLLER, see AEM X-Series for a Gauge Type UEGO Controller! 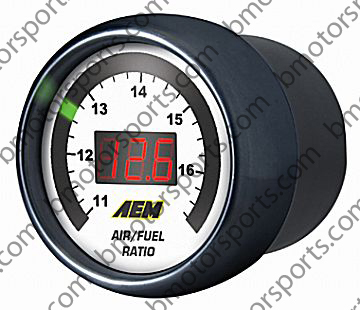 AEM UEGO Gauge Display Black Bezel / White Face - PN 30-4123. ONLY for use with AEM Wideband UEGO Controllers 30-2300 & 30-2301 ! AEM’s UEGO Display Gauge allows owners of AEM Wideband UEGO Controllers 30-2300 or 30-2301 to monitor Air/Fuel ratios (AFR) in real time without the use of a laptop. This gauge includes a 0-5 Volt analog output to interface with most data-loggers or aftermarket engine management systems, and includes an RS 232 serial data output port for data logging without an engine management system. AEM’s UEGO Display Gauge is calibrated to work with AEM UEGO sensor controllers ONLY. These units display to 0.1 AFR, feature 24 color-coded LED display lights for immediate reference to engine AFR, and have an integrated three-digit real-time display for AFR. AEM’s UEGO Display Gauge displays one channel only, so users wishing to display two channels simultaneously will need two gauges (V6 to V10 applications). Ballenger Motorsports - High Performance Electronics accepts all major credit cards, including international cards. We also accept Paypal, Check, Money Order and Purchase Orders with account approval.